These impressive apartments are located within a Grade I listed building (awarded the coveted Blue Plaque) and set in a beautiful Georgian square with central gardens. All flats recently modernized and spacious with dishwashers, designer leather sofa's, digital keyless entry. Penthouse with Neo-classical bathroom/W.C. 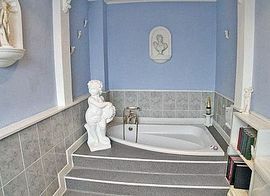 with statues, arches, shower over sunken corner Jacuzzi-style bath and shower attachment. 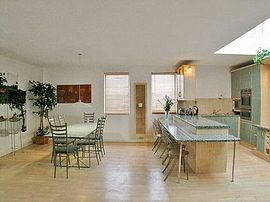 Modern fully fitted kitchens with high gloss granite-style worktops, breakfast bar, washing machines etc. Several glass atriums allow light to flood in; central is a custom made 6ft wind chime. Roof terrace offers magnificent views of city. Ideal location; 2 minutes walk to Cabot Circus main shopping centre, 50 yards to M32. 10 minutes walk to main amenities including Bus / Train Station, University, Temple Gate, Hospitals, Law Courts, Park Street. Within the building is a ground floor Café and across the square are two wine bars both serving fine food. Presiding over the square is the famous St. Peter and Paul wedding cake-style church, now housing a trendy media café and circus training school. Although smoking is not allowed inside the apartments, you can smoke on the roof top terrace. Local Services: Within the square there are two wine bars. Both have live music on selected nights. Both serve pub lunches and evening meals. 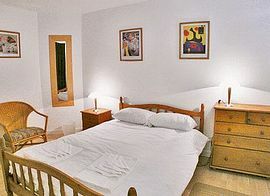 The apartments are only a few minutes walk away from the shopping centres and the local restaurants. Take junction 19 signposted M32 Bristol. Follow M32 towards city centre, just after junction 3 and prior to the first set of traffic lights turn right signposted St. Paul's. As you enter the square turn left and follow it round to number 21 on the opposite side of the square. Take junction 15, (signposted London, South Wales), stay in the left hand lane to join M4 (signposted London). Take next junction, 19, signposted M32. Follow the M32 towards city centre, just after junction 3 and prior to the first set of traffic lights turn right signposted St. Paul's. As you enter the square turn left and follow it round to number 21 on the opposite side of the square. 2 minutes walk from Bristol Bus Station. 15 minutes walk from Bristol Temple Meads train station. Shuttle bus service from Bristol International Airport to Bristol Bus Station. For full tariff details please see our website. All prices are per unit per night. Spring: From £42.00 to £285.00. Summer: From £55.00 to £301.00. Autumn: From £42.00 to £235.00. Winter: From £41.00 to £313.00.